What Does Howling Mean for Cats? Your cat's howling could indicate a health problem. Howling in cats can be signs of an underlying health problem, but this type of excessive vocalization can also be a completely normal occurrence. Figuring out what is causing your cat's howling behavior is the first step to modulating your pet's meows. In some cases, howling is simply a reaction to boredom or stress. If your cat has recently experienced a change in routine, such as a move to a new home or the addition of a new member to the family, she may start howling to express her displeasure. A cat who feels bored or left out may vocalize more to try to get your attention. You can reduce this type of howling by dedicating time to spend petting and playing with your cat each day. Feline stress reducers, such as pheromone sprays, may also help calm her down and reduce the likelihood of howling. If your female cat has not been spayed, she might be howling because she is in heat. Unneutered males may also howl more than neutered males, both when encountering a female in heat and during the mating act itself. Spaying or neutering your cat will probably reduce howling behavior, as well as preventing unwanted kittens and reducing other undesirable behaviors, such as spraying. A cat may emit a quick, short howl during play if he wants to protest being held or if the play has become too rough. A more sustained howl may be a sign something is seriously wrong. An ailing cat may let out a few howls because he is uncomfortable or in pain. For example, if your cat develops urinary crystals, he may howl when in the litterbox because it is painful to pass those crystals. If your cat does not normally howl but is making loud sounds and behaving like he might be ill or injured, take him to a vet as soon as possible for a thorough assessment. 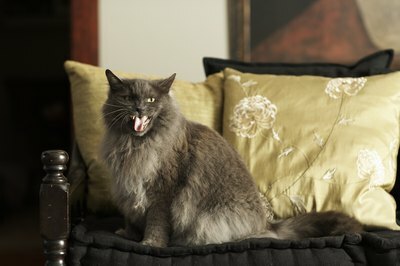 If your older cat has started developing a howling habit, it could be a sign of encroaching dementia. Cognitive dysfunction syndrome is the gradual decline of brain function over time, and it impacts about 50 percent of cats over the age of 15, according to the Ohio State University College of Veterinary Medicine. If your cat develops CDS, she might howl out of confusion and anxiety. CDS is incurable, but you might be able to reduce symptoms using medicines, dietary supplements or changes to the cat's environment. Animal Planet: why Do Cats Howl More When They Get Older?